Email marketing is the constant in the fast-growing world of digital marketing. While social media platforms are increasingly influential, email marketing has remained the top ROI channel for over 10 years. Keep up with the trends of social media, but know that they fade in and out of popularity. Conversions boil down to lifetime brand loyalty, which is measured in email clicks- not views on this month’s social app. Open rates, click through rates, conversion rates… these are the major metrics that unlock a strong ROI. So, how do you optimize your email marketing campaign to increase these KPIs? Less is always more and enticing subject lines are a must. While these are great foundational principles to see email open and read rates skyrocket, stopping there is a massive mistake. The next piece to the conversion puzzle is finding and optimizing strategies that impact click through rates. Your email marketing must have a clear messaging layout with consistent CTA’s. Clear messaging means that your reader’s eyes should be guided to the links. Consistent CTA’s reinforce the same link destination, which will increase your click through rate. More than one CTA link destination will cause confusion, slow down the reader and reduce email clicks. Sending emails that align with your customers’ interests will increase click rates. Not all who wander are lost – you can re-engage those users who didn’t convert with a real-time lead collection tool. Upsellit’s PreCapture Technology gathers email information, without the shopper needing to press submit. Upon abandonment, a triggered email series with escalating urgency (or incentives) lures the shopper back to the checkout page. While a clear layout and an interested audience is a strong first step, increased click through rates requires the perfect dose of persuasion. Persuasion shouldn’t sound obvious or desperate; your marketing efforts should subtly guide to the consumer to conversion. 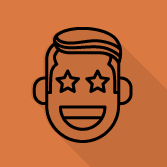 Here are 4 principles of persuasion to get your customer to click through. Information gaps give your recipient a reason to click through. Information gaps are a lot like cliff hangers in your favorite TV Show. Information gaps are why Netflix is such a hit and you click “continue watching” after 2 ½ hours. Information gaps are best exercised in the email copy – and not in the subject line. Invoking curiosity in the subject line is crucial to get the email opened, but that isn’t the place for the big question. If you have satiated curiosity in the email body, why would your potential customer click-through? In the subject line pictured above, Refinery29 starts the email conversation with a bold, intriguing statement. 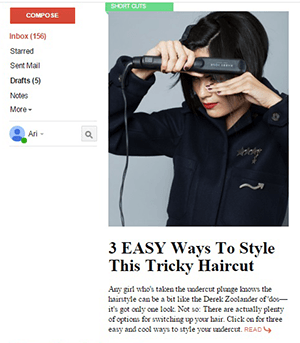 After opening the email, the reader is shown a teaser photo of the promised ‘haircut of the season.’ The caption below the disguised photo promises ‘3 EASY Ways to Style this Tricky Haircut’ but still doesn’t reveal the cut itself. No tactic is more effective at getting people to act than providing a solution to their FOMO (for those of you living under a rock, that means ‘fear of missing out’). “People are more motivated by a possible loss than a potential gain” and that’s why capitalizing on consumers’ FOMO is so persuasive. FOMO tactics are aimed at leveraging scarcity, deadlines and time-sensitive language. These strategies not only send the message that they will miss out, but more importantly – that other people aren’t. Limited availability, limited supply and limited time are highly motivating factors, but only when employed with credibility. Think of a babysitter who threatens time-outs… and continuously re-threatens timeouts. The child will learn to not believe the babysitter. With marketing emails, “for a limited time” can be convincing, but not if it’s seen in your recipient’s inbox too many times. Also, it’s best to place incentives towards the end of your email series, so that way you customer doesn’t learn to expect a discount upon abandonment. On the heels of employing scarcity tactics, a positive solution can be refreshing. It’s human nature to respond to positivity; positivity increases motivation. Similar to how the informational gap evokes curiosity and a click, positivity elicits engagement and a desire for fulfillment. Utilizing positively-framed messaging can increase click-through rates significantly. While some may say that our media is controlled by the presence of negativity, some major companies have reshaped their brand identity through positive campaigns. Extra, one of Wrigley’s chewing gum brands, recently released a video about how having a piece of gum ready to share might just change your life. Everybody knows the pain of being spotted in a classroom with a pack, getting called out to share 1 piece and eventually giving away your entire pack of gum. In “The Story of Sarah and Juan”, Extra took this classic school situation, put a positive spin and turned sharing gum into a heartwarming, viral story. While not a formula, these are 4 persuasion principles based on human behavioral tendencies that can be highly effective in marketing emails. Emotions are a dominating factor in choice, whether it’s face to face communications or through the Internet. Shifting language to elicit an emotional response is a great way to keep your customers engaged and clicking through your marketing emails. If you are interested and want to learn more about mixing technology and persuasive marketing ideas to increase conversions, contact Upsellit!